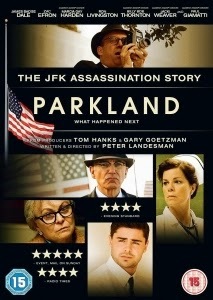 Released in time to mark the 50th anniversary of the John F. Kennedy assassination, there was always going to be a question mark over the integrity of Peter Landesman’s Parkland (2013): was this made to cash in on public interest, or is it a carefully researched ode to a much-loved president? On the outside it appears very polished with an appealing lineup of cast members, which helps to tickle the fancy of the sceptical viewer pondering if there are any angles left through which to view the events. Landesman developed the script from Vincent Bugliosi’s Four Days in November, following suit in opening on the morning of the tragic Dallas motorcade shooting. The assassination itself happens just eight minutes in, by which time tension has been skilfully built, only to under-deliver on the feeling of panic and chaos in the streets – a trick missed after such an effective build-up. The drama continues throughout even after the shooting and Parkland is engaging in parts, but its biggest downfall is the scattering of questionable moments. Amongst the sincerity there are some over-the-top elements that take away from the mood created from the combined efforts of the camerawork and the cast. The main offender is Jacki Weaver as Margherite, Lee Harvey Oswold’s mother, whose caricature performance detracts from James Badge Dale’s infinitely subtler turn as the ‘other son’, Robert. Further issues also arise in the operation scenes, as an overwhelmed Dr. Carrico (Zac Efron) furiously pumps Kennedy’s chest in a vain attempt to resuscitate him. It would have been effective for a few moments but carries on for over a minute, shortly preceded by a shell-shocked Jackie Kennedy (Kat Steffens) handing her husband’s brain matter to Marcia Gay Harden’s stoic and compassionate Nurse Nelson. To add to the intimacy Landesman’s cameras create, his adapted screenplay errs on side of caution and is moving without being melodramatic (although the patriotism is perhaps overplayed, with too many people trying to do the ‘right’ thing). There are some beautiful and poignant moments in Parkland, as well as an enthralling undercurrent of melancholy, yet this overriding effect is often hamstrung by missteps in characterisation and casting.